This is an incredible opportunity to sail the high seas, on one of the last wooden sailing ketches in the world, while tasting some amazing whiskies. Only nine customers will be able to set sail with us, so this is as exclusive as it comes! 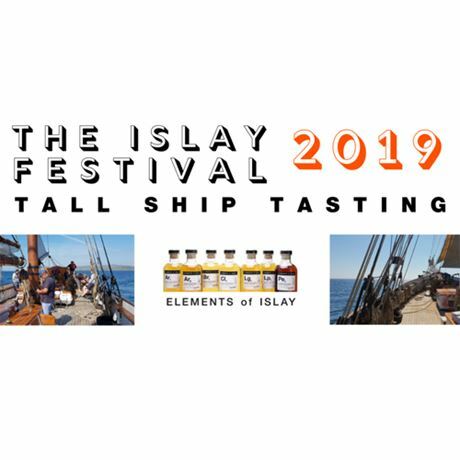 The tasting itself will be of the latest from the Elements of Islay, Port Askaig and Single Malts of Scotland range, with the man who puts them together, Mr Oliver Chilton – Whisky Creator for Elixir Distilling. Ollie is fast becoming a legend in the industry and is famous for his no-nonsense approach and technical know-how, not to mention his involvement in a new Islay distillery. If its geeky you want, he can give great geek. If you just want to enjoy the whiskies, you can do that too! The Irene is one of the last remaining wooden sailing ketches in the world. She is over 100 years old, a sight to behold and has a fascinating story herself, which the ship’s crew can tell you all about onboard. The ship has her own acclaimed chef on board who will be preparing some tasty nibbles for you, to ensure you don’t go hungry! We’ll be boarding the Irene at Port Ellen Pier at 1.45pm to set sail at 2pm sharp. Bring your sea legs, waterproofs and anything else you think you’ll need for this voyage. Life jackets will be provided! Please note that all Tall Ship Tastings are weather dependent.